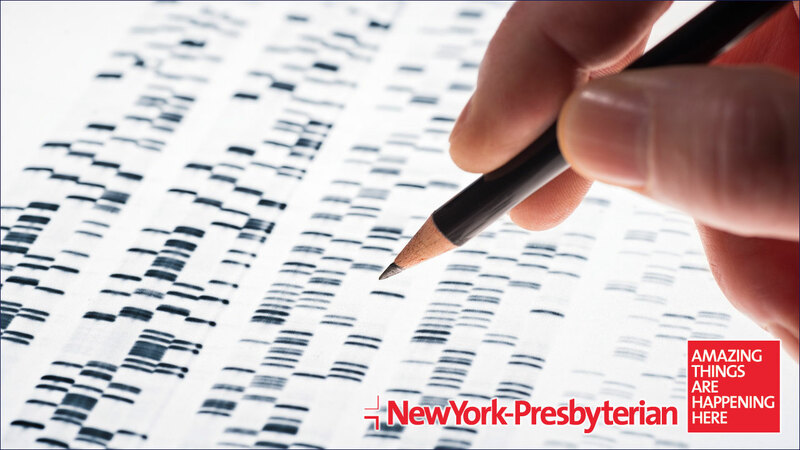 NEW YORK -- The association of the BRCA gene mutations with breast and ovarian cancers is common knowledge, and work in this area has produced effective treatments and sometimes the means of prevention. "But it is much less known and understood that these mutations have been linked to several gastroenterological cancers, including pancreatic cancer," says John A. Chabot, MD, Chief of the Division of GI/Endocrine Surgery and Executive Director of The Pancreas Center at NewYork-Presbyterian/Columbia University Medical Center. "For men and women who carry the BRCA mutations, there is about a three- to four-fold higher risk for pancreatic cancer." Fay Kastrinos, MD, a gastroenterologist in the Division of Digestive and Liver Diseases, NewYork-Presbyterian/Columbia, works with families who are at a high risk for almost all of the inherited gastro-intestinal cancers. "Pancreatic cancer can be associated with multiple familial cancer syndromes," says Dr. Kastrinos. "The connection and risk of pancreatic cancer may be with cancer syndromes involving breast, ovarian, and colorectal cancers, as well as melanoma. The connections can be very broad." Dr. Kastrinos notes that because genetic testing has expanded to where multiple genes associated with cancer can be tested simultaneously, there is now another component to add to family history in defining individuals and/or family members at risk. "A lot of information is continually becoming available," says Dr. Kastrinos. "What is important to achieve in a high-risk cancer genetics and prevention program is identifying which genes are important to consider testing for, interpreting the results of testing and the associated risks of cancer, and concluding which results are clinically actionable and meaningful, where options for screening for cancer prevention can be considered." Dr. Kastrinos stresses the necessity for a comprehensive multidisciplinary approach to taking care of patients and families with these gene mutations. It involves a team of oncologists, surgeons, pathologists, radiologists, gastroenterologists, and genetic counselors, and the approach to each patient and family is personalized. "In our program, we hone in on each individual and the details related to their personal cancer and also those in his or her family," she says. Dr. Kastrinos and her colleagues are able to offer genetic risk assessment to family members with the goal of preventing cancer before it develops or treating it in its earliest stages. "When looking at the family history of those who come in with pancreatic cancer, we have been surprised to find previously unseen connections - pancreatic cancer related to breast-ovarian cancer syndrome, melanoma, or related to a colon cancer familial syndrome," says Dr. Kastrinos. "Not every physician is going to know all of the different clinical criteria associated with familial cancer syndromes that will drive when genetic testing should be considered." About 1 in 400 individuals in the general population may test positive for a mutation in the BRCA1 and BRCA2 genes. * Certain populations are more likely to carry mutations of the BRCA genes. Research conducted by faculty at The Pancreas Center found that approximately 10% of pancreatic cancers seen in The Pancreas Center are associated with breast and ovarian cancer syndromes caused by BRCA1 and BRCA2 mutations. "The patient who is identified as BRCA positive when diagnosed with pancreatic cancer should be screened for ovarian and breast cancer and vice versa," says Dr. Chabot. "We need to manage the patient's care, but also advise the patient's family members and encourage them to be evaluated. If a family member is identified with a BRCA1 and/or BRCA2 gene mutation, there are implications for treatment." For example, early screening for pancreatic cancer may be recommended when certain risk factors, particularly positive genetic associations, are present. Early screening can lead to early diagnosis of pancreatic cancer at a stage when it is most treatable. "Identifying someone with pancreatic cancer with these gene mutations also may guide the type of chemotherapy recommended," adds Dr. Chabot. "Our patients have had improved responses to individually tailored therapy regimens based on genetic testing." The optimum step for the family with a history of pancreatic cancer is a referral for a genetics evaluation. "These families need specialized attention, which includes genetic referral and evaluation," advises Dr. Kastrinos. "Here at Columbia, our families receive counseling pre-testing and post-testing, which is very important for appropriate and timely follow-up. The evaluation is comprehensive - determining who should have genetic testing, how we interpret the results, and how the results guide the care and clinical management of our patients and families." Both Drs. Chabot and Kastrinos are extremely sensitive to the issues involved in genetic testing for the patient and their family members. "We generally recommend to the patient that they deal with the cancer that they're facing first," says Dr. Chabot. "After they recover, we then focus on prevention for the other organs that could potentially be involved, as well as testing of family members." Drs. Chabot and Kastrinos are in regular communication with their breast cancer colleagues at NewYork-Presbyterian/Columbia. Among them is Katherine D. Crew, MD, MS, a medical oncologist in the Division of Hematology/Oncology at NewYork-Presbyterian/Columbia. "In our clinical breast cancer prevention program, we counsel women who may be at high risk for developing breast cancer," says Dr. Crew. "Those who test positive for a BRCA mutation will be followed in our high-risk prevention program so that we can counsel them on the potential for risk-reducing surgery, medical management, and intensive screening. This is not only for the patient, but also for their family members as well in terms of discussing options that are available for them to help manage their cancer risk. In light of what we now know for both men and women who carry the BRCA mutations and the link to pancreatic cancer prompts us to refer patients to Dr. Chabot's Pancreas Center and Fay Kastrinos' program." "We see hundreds of people from this region who are carrying BRCA gene mutations, and we employ a truly interdisciplinary team, which personalizes and creates targeted treatment or prevention if possible," says Dr. Chabot. "As we discover these unforeseen connections, such as the link among breast, ovarian, and pancreatic cancers, we can continue to develop and offer effective clinical protocols to patients and remain hopeful."